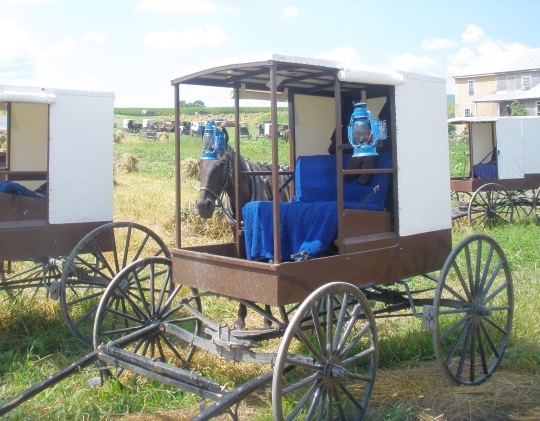 Reader Jerry often attends Amish auctions around the Keystone State. 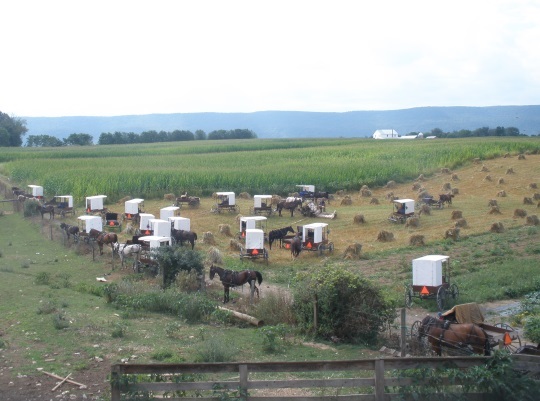 Today he shares an account and photos of an event which took place last month, a medical benefit for an injured Amishman. The community here is a Nebraska Amish group, a small affiliation traditionally considered among the most conservative (though there are more liberal factions within the larger group). There aren’t many Nebraska Amish settlements, but this is the largest, found in the Kishacoquillas Valley (aka Big Valley). I’ll let Jerry take it from here as he shows us around the farm and auction. 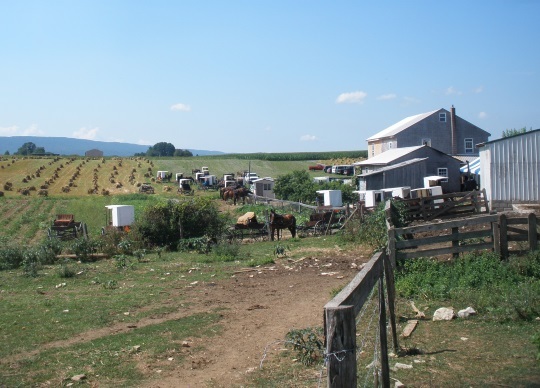 Today I went to an Amish Benefit Auction in Milroy, PA. Milroy is about 25 miles south of State College and on the edge of Kish Valley (the Big Valley). The auction was to help cover the medical costs of an Amish man who was hurt in a recent logging accident. He’s still in the hospital. This auction was held on a church member’s farm. 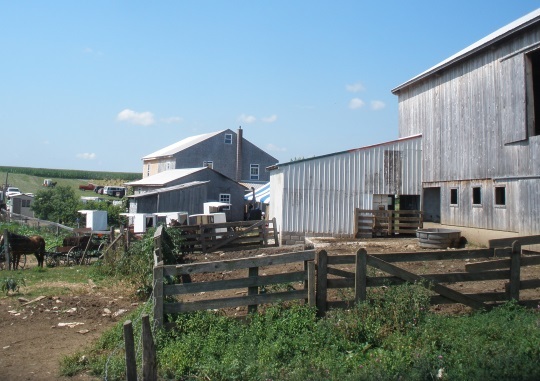 Farm auctions allow you “get down and dirty” and view daily life a bit closer. Before the auction, the local bishop lead a prayer for the injured man and his family. 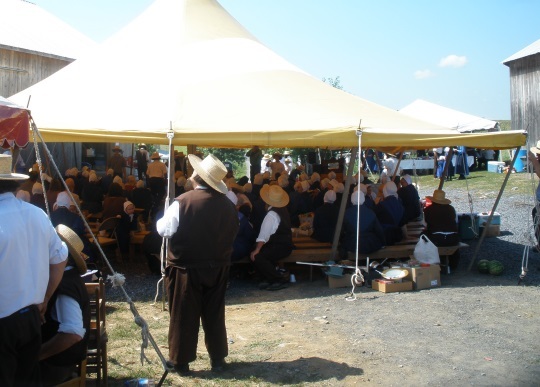 It was an event attended mostly by Amish. Probably 150 buggies and only 16 motor vehicles at one count. Here is the buggy parking lot. Those are shocks of oats scattered in the field. And some more buggies at the next farm over. 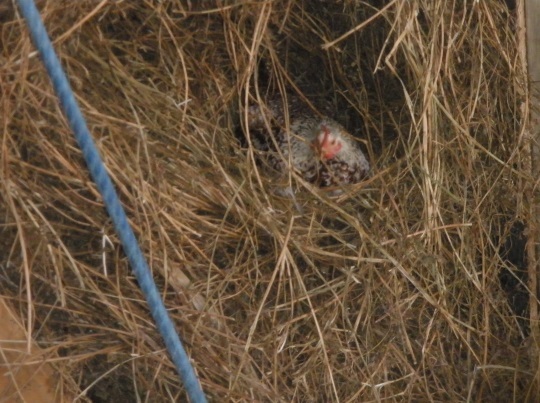 The farm is not your spotless calendar art that you expect to see in Lancaster County. The barn is in better condition than the house. The house has yet to have siding added. There was a large quilting frame set up in the first room. 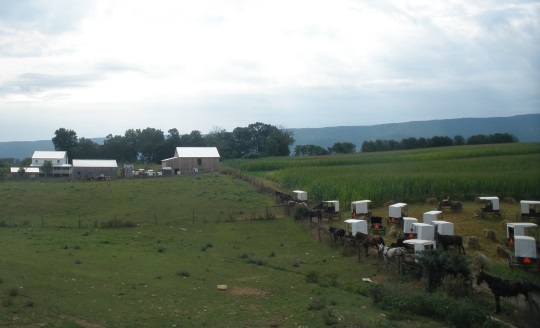 Here is the farm house and more buggies. It was a well-attended event, mostly by Amish. The food was excellent. $2.50 for a breakfast sandwich, $2.50 for excellent vegetable soup, $1.00 fruit cup, .75 for homemade ice cream. A fish sandwich for $3.00. A half chicken for 3.50. Everything was super fresh, filling and value priced. I did buy a pieced wall hanging for $5.00 and I have it on eBay right now. I’m hoping to sell it for $30.00 and give the money to the committee for the sale. $5.00 was just too cheap. Hand made but I think they used a machine. EBay item number 301708423969 for a closer look. 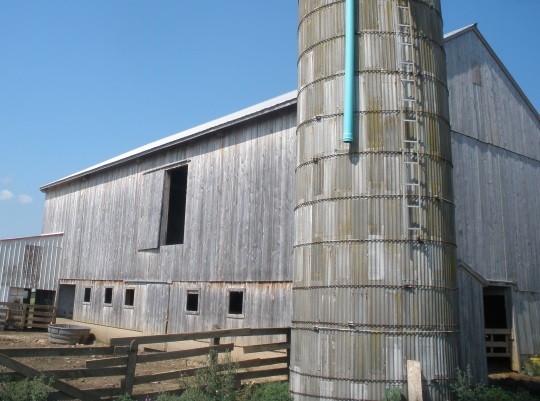 A nice barn. It looked better than the house. 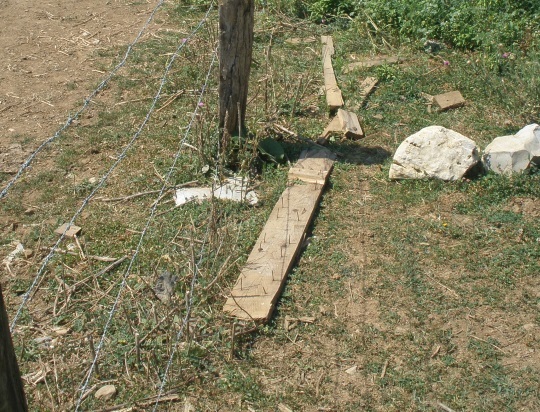 A board with nails sticking up in the barn yard. This is the real world folks. 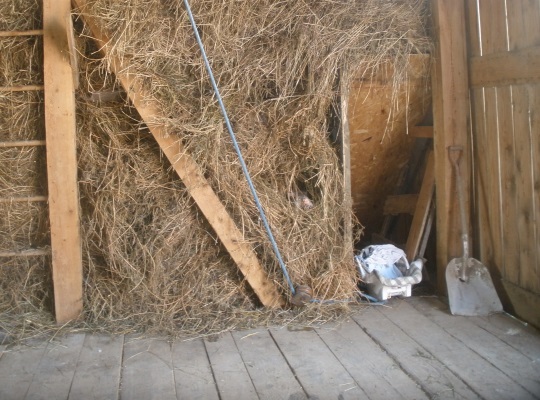 Loose hay in the barn. Do you see what I see? She was sitting on about 20 eggs. 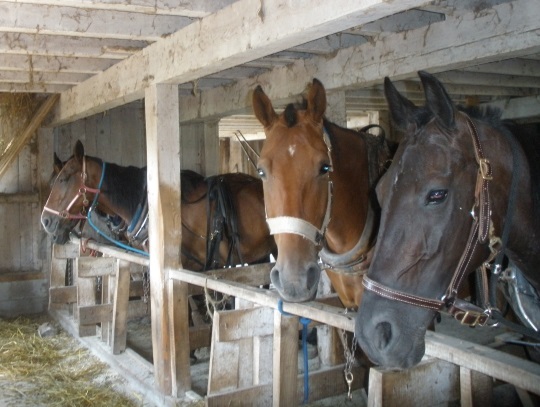 Horses in the lower part of the barn…. A run-away hog being escorted back to the sale pen. The white shed, right center, is a well insulated ice house. A buggy up close. Metal wheels. No rubber up here. No bicycles either. 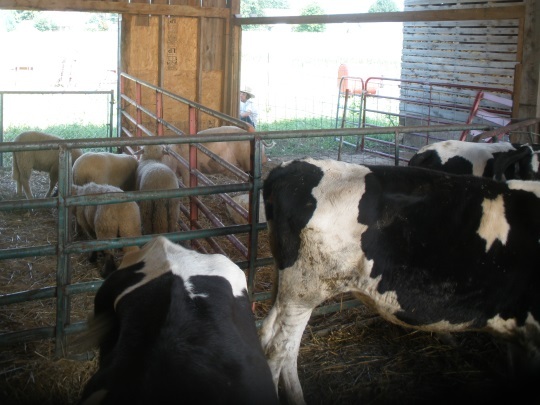 Animals that were consigned for sale. And the drive home was a pleasure as well knowing that I just had a super day. As I was getting my bidder number an older English man was before me. He presented the clerk with a check and ask how could he write it. The Amish clerk stamped his check with the proper “pay to” line for his check. He was making a donation to the event before the auction started. I thought his giving of cash (check) said volumes about how the people in this area responds to a need that makes us all better people. This man was giving a donation to help the cause. I don’t know if he knew the logging accident victim or not. This man was giving for the cause. My faith was renewed. His deeds and the entire concept of the benefit auction was helping someone who deserved and needed help. That’s what Amish do and in this case that’s what we all do when we see a need and have the resources to help. 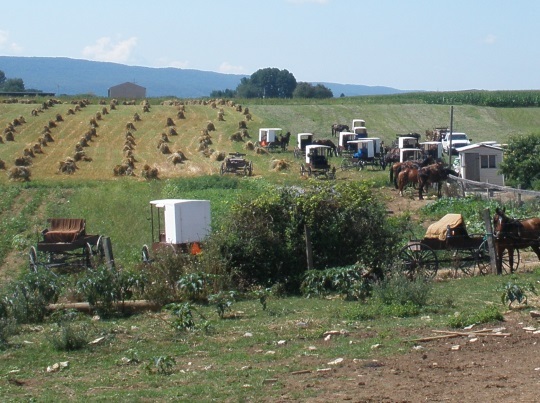 This is an awesome show of community, and I think the Amish generally serve as examples to us all. Slightly-Handled-Order-Man: You need to check out the Conservative Friends of Ohio Yearly Meeting. They have a member in Big Valley. Thanks for the photos, Jerry! I met someone who was ex-Amish from Big Valley (can’t remember if he said he was Renno or Byler Amish), and he told me that some Nebraska Amish have cell-phones, now. I wondered if you saw any of that during the auction. It’s a treat to get to see photos of this group! Thanks again! Yes, I saw four or five this day and the following Saturday they had an even bigger sale about three miles away. The latter sale has been an annual event for many years. I noticed that an equal number of men and women had phones. All of them were older “flip” models. 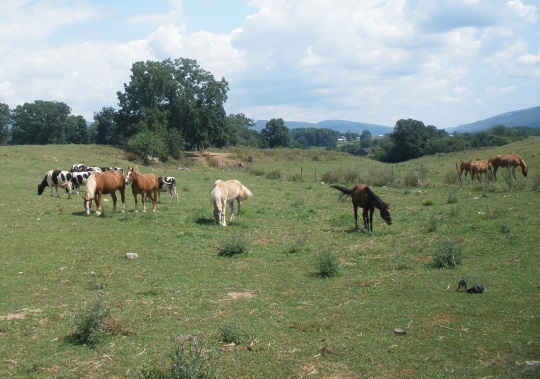 Funny side note…In 2014 I attended a sale on the other side of Jack’s Mountain and there all the teens had smart phones and this year when I was there not a single smart phone was to be found. I do find phones (a few smart ones) all over South Central Pa. They’re about as common as flip-flops among the Amish here. In Synder County I still see lots of OOM using land line phones in that little booth down by the road. Not sure what to make of the “most conservative” Amish using cell phones. Maybe this is a case of seeing they are so different in other ways they don’t view the cell phone as much of a threat. Or maybe they see it as a way of easily staying in touch with the wider Nebraska group thus facilitating a stronger feeling of community which would encourage the youth to stay in the church. Funny that you saw a bunch of smart (or should it be smarty?) phones last year but not this year. I suspect someone has preached very strongly against them. Thanks again and have a good Labor Day weekend! I live so close and saw this auction listed, but have never attended any of their auctions. Think I should go next time. Milroy is actually closer to State College than mentioned in the story; probably only 12 to 15 miles over the 7 mountains. 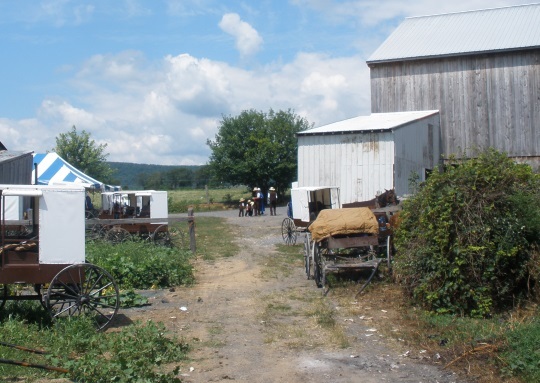 This group of Amish and the other 2 in the valley are often seen using cellphones. I just found that a “white topper” teenager even has a Facebook page. He must have a smartphone! I’ve noticed that this group is more likely to have their picture taken also, as evidenced in all the photos of Bill Coleman. I find that the black and yellow toppers (Renno & Byler) will not permit any photo taking. I just recently had asked to take a picture of a young furniture maker’s items and he wouldn’t allow me to since he still owned them. I thought I’d be doing him a favor with free advertising of his nice wood crafting on my Facebook page, but wasn’t permitted to unless I bought it first! He was a black topper. Some break or twist the rules a little and some stay firm. . . . . but I’m sure they caught him. The wall hanging sold on ebay. 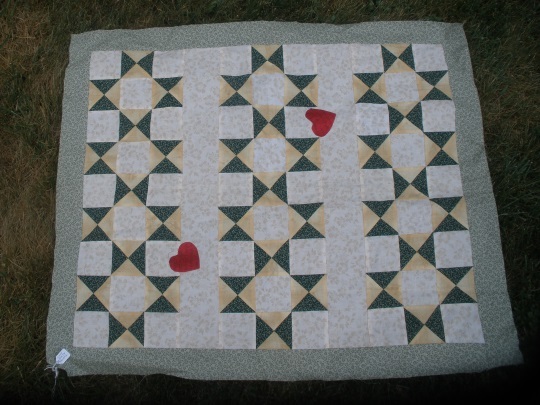 Thank you Amy H. for buying the pieced panel. It was very gracious of you to do that. Amy paid $46.00 which might have been a bit much but her heart was in it to help.. 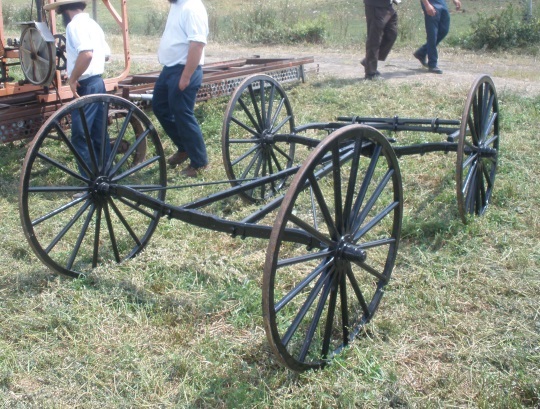 This short notice auction benefited an Amish man who was hurt badly in a logging accident. I’ll take the money up there either this Saturday as I will be in nearby McClure for the Bean Soup Festival, or next Wednesday when I go to the Reedsville Flea market. Thanks again Miss Amy.